Home News Oil Pulling Detox – Best Oil for Oil Pulling? Oil Pulling Detox – What is the Best Oil to use in Oil Pulling? Well if you are familiar with Oil Pulling you might be looking out for your preferred choice, be it Oil Pulling with Coconut Oil, Sesame Oil, Sunflower Oil or even Oil Pulling with Olive Oil? After all, what we are trying to avoid is “pulling teeth out”. Perhaps more important then answering the question: How to Oil Pull? or How often to Oil Pull? here we share some special insights, which you might want to include in your oil-pulling regime – wisdom going back thousands of years, which you might wish to embrace and get working for you. Most seem attracted to try out Oil Pulling with Coconut Oil or even Olive Oil. Yet, what we are talking about here is opening “mother natures pharmacy” fully to benefit from what she has prescribed to dental patients over the centuries to discover the best possible oil – one sure to deliver the full range of benefits oil pulling has to offer, for good oral care of teeth, gums and the whole oral cavity. 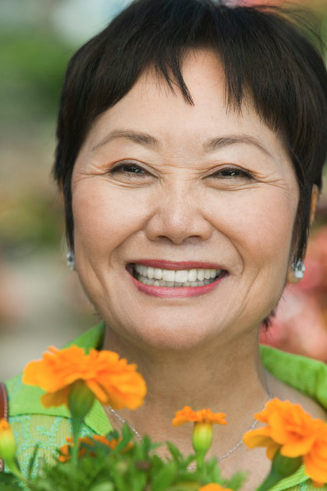 Innovative and prolific as mother-nature is, we can see how she has really done the business for us all – providing numerous active ingredients designed to maintain, protect, preserve and freshen our overall ‘smile’. Further, in looking after our oral health, our overall immune system is assisted and bolstered because as fewer unhelpful bacteria are swallowed from the mouth cavity, our overworked immune system and liver has fewer toxins to process and expel from the body. Babchi seeds & Babchi oil used traditionally in Chinese & Indian Ayurvedic medicine is a rich source of calcium and can assist in enhancing calcium in the system, the essential oil of Babchi also has antibacterial, astringent, antiseptic and antimicrobial properties that aid in the treatment of plaque, weak gums, halitosis or bad breath, bleeding gums and other oral conditions. 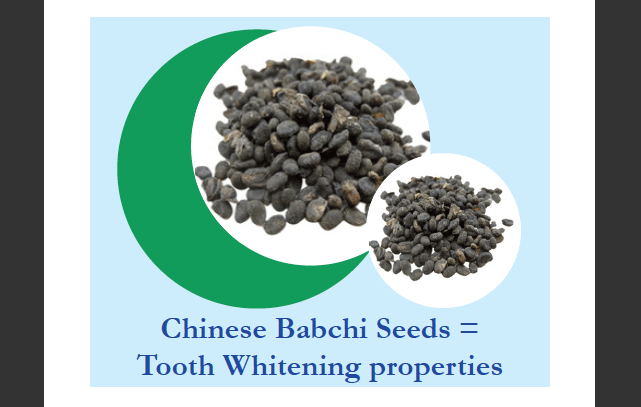 A natural tooth whitening property is ascribed to the Chinese medicinal babchi plant. 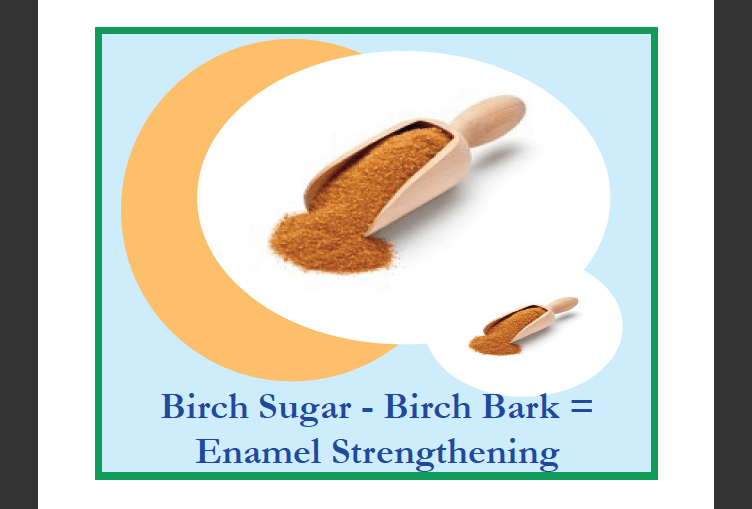 Birch sugar from natural birch bark, common throughout Eurasia, is well known as a natural ingredient which acts to prevent tooth decay as well as to remedy the condition of the teeth already damaged. In addition, birch sugar is also beneficial for the rigidity, density and mineral content of bones. Therefore, beside tooth decay birch sugar may also help delay osteoporosis as well. Scientific observations have also pointed out that young mothers who use birch sugar or products with birch sugar content discourage the development of the bacteria causing tooth decay in their babies. These children may well face fewer tooth-related troubles in their later lives. 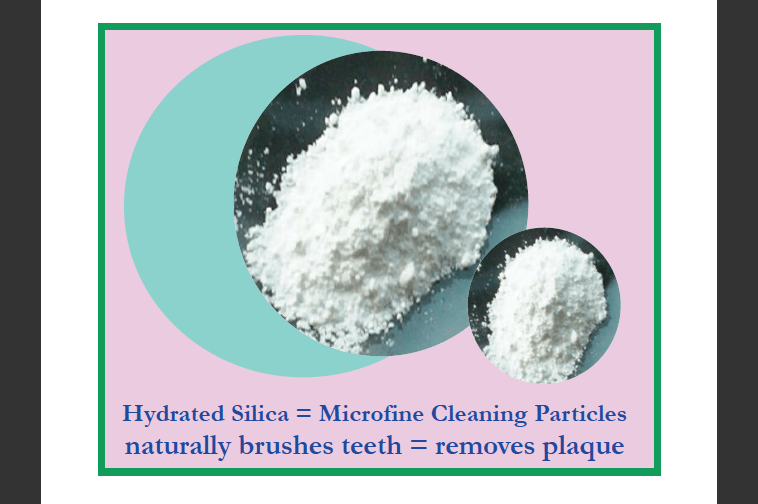 reduces the development of plaque. Bacteria causes tooth decay as they take up and break down any sugar we may consume in daily foods. Certain six-carbon sugars (beet sugar, fruit sugar, cane sugar and grape sugar) act to multiply the number of the bacteria and as these sugars are broken down, the bacteria produce acid/acids which can act to damage the tooth enamel, and thereby encourage tooth decay. However, bacteria are unable to break down the five-carbon structure of birch sugar so no acid is produced, consequently tooth decay may be prevented and the pH value of the mouth may be kept in better balance. Of course the birch sugar has to be from a highly pure source to be potent and effective in this regard. Cinnamon is an evergreen plant. Cinnamon oil is derived from the bark or leaves. The two most commonly used cinnamon varieties are Ceylon cinnamon or true cinnamon and Cassia or Chinese cinnamon. There are several beneficial chemicals found in cinnamon bark, like volatile oils – cinnamal, and eugenol. Cinnamon essential oil can be used like clove oil to kill bacteria that cause periodontal disease and ease a toothache due to its antifungal, antibacterial properties. Historical records show that dentists used cinnamon oil in cavity treatment since it was tasty. 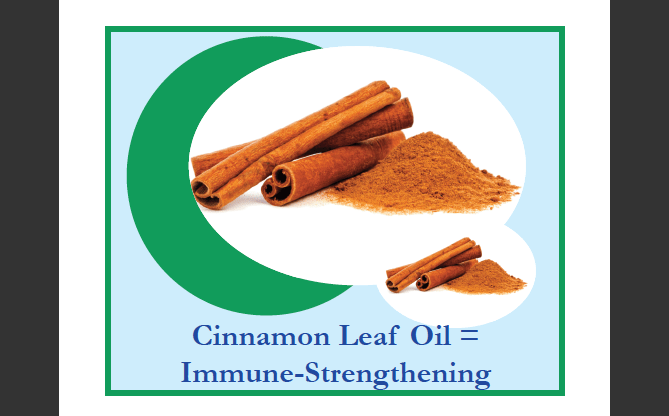 In studies Cinnamon essential oils have demonstrated strong antimicrobial activity on microorganisms. Studies demonstrate that cinnamon oil can be used for therapeutic purposes to treat infections and diseases caused by such bacteria. Since cavities are caused by plaque, which is caused by bacteria, cinnamon can be used to treat cavities too. Research conducted in New Zealand reported that Cinnamon Oil has tremendous antimicrobial potency to effect streptococcus mutans, the bacteria responsible for tooth decay, and against lactobacillus plantarum, a bacteria responsible in gum disease. Probably one of the most well known treatments for the common toothache, cloves is the aromatic flower buds of an evergreen tree native to the Maluka Islands in Indonesia. Over decades there use has led to the propagation of the crop far and wide. 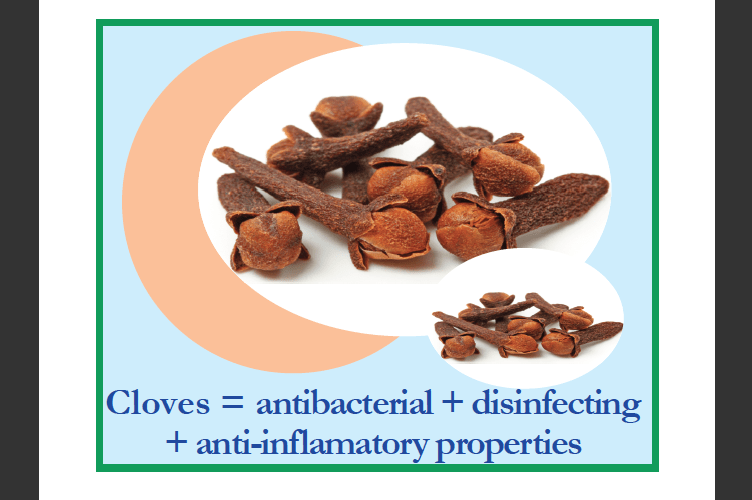 Cloves are used in India Ayurvedic & Chinese medicine and in western herbalism an dentistry where th e essential oil is used as a painkiller, often available at high street pharmacies for use in dental trauma and severe toothache. In the past, dentists have used clove to disinfect disturbed root canals, since clove has moderately strong germicidal properties. A recent study showed that clove essential oil has a particular ability to inhibit the growth of mutant bacteria, hence its well-documented use. Clove has been used medicinally in several cultures for many years. Traditional Chinese Medicine has applied clove for relieving tooth pain for hundreds of years. Clinical research demonstrated that clove inhibits many pathogenic bacteria, including Staph aureus, strep pneumoniae, and shigella. Dentists historically used clove to disinfect disturbed root canal. Recent research has shown that the essential oil of clove has the strongest ability of the 21 oils studied in inhibiting bacteria growth. There are over 700 species of eucalyptus, mostly evergreen, which are mostly native to Australia. Since the 1770’s various species of eucalyptus became cultivated more widely across the world. Eucalyptus essential oil is obtained from fresh leaves of the tall, evergreen eucalyptus tree. 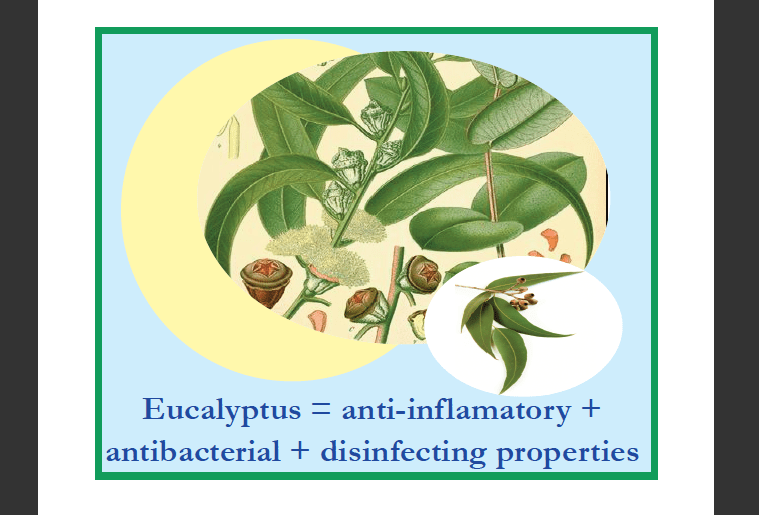 The health benefits of eucalyptus oil are well-known and wide ranging, and its properties include anti-inflammatory, antiseptic, antibacterial medicinal qualities, which are effective against cavities, dental plaque, gingivitis and other dental infections owing to these germicidal properties. This is why eucalyptus essential oil is so commonly found as an active ingredient in mouthwash, toothpaste, and other dental hygiene products. 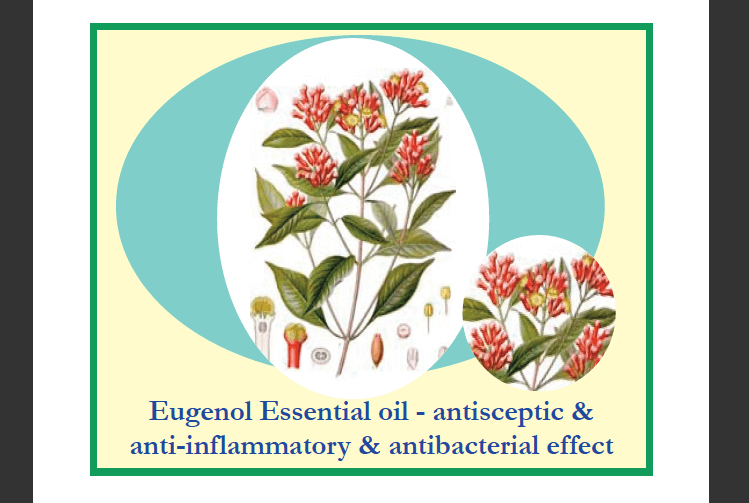 Eugenol is a colorless to pale yellow oily liquid extracted from certain essential oils especially from clove oil and cinnamon. It is present in concentrations of 80–90% in clove bud oil and at 82–88% in clove leaf oil. Green tea is made from Camellia sinensis leaves that have undergone minima oxidation during processing. Green tea originated in China, but its production has now spread to many countries throughout Asia. 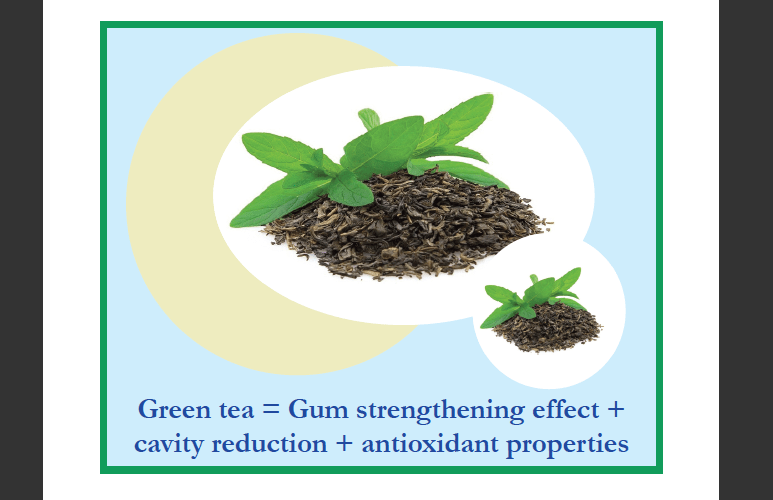 Green tea contains soluble polyphenols, and their efficacy is often attributed to astringent substances, which bind the salivary proteins, causing them to precipitate or aggregate. Evidence for the role of Polyphenols in the prevention of degenerative diseases such as cancer and cardiovascular diseases is emerging. Deep cleaning is provided via the presence of micro-fine cleaning particles made from hydrated silica, which is a natural form of silicone dioxide. It is found in nature, as apoal, a mineral-oid mined as a gemstone for centuries, it also occurs in the cell walls of diatoms (algae). It is also known as silici acid, a term usually used for its form when dissolved in water. Opal is the national gemstone of Australia . The lemon is a species of small evergreen tree native to Asia. The low pH of juice makes it antibacterial. According to a study published in the International Journal of Food Microbiology, lemon oil may actually be the most powerful anti-microbial agent of all the essential oils. 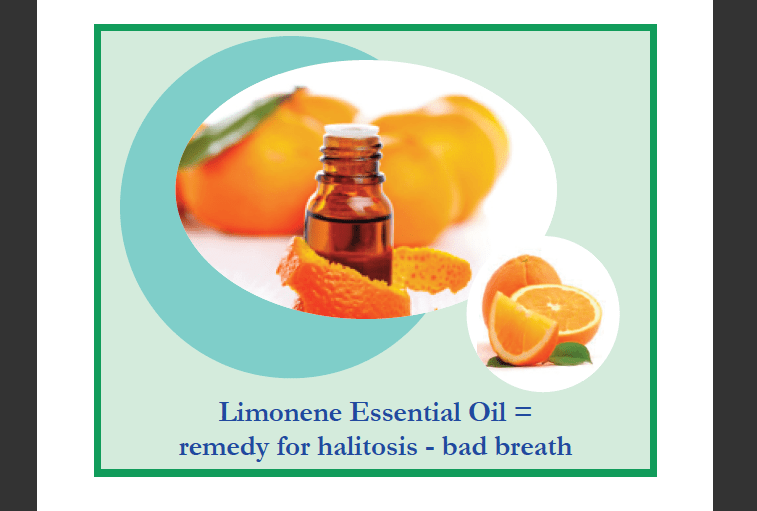 It is well known as a remedy that that can help with halitosis (bad breath). Lemon oil is cold-pressed from the aromatic rinds of lemons, not the fruit. It is pH neutral as it does not contain citric acid and is safe for the teeth enamel. 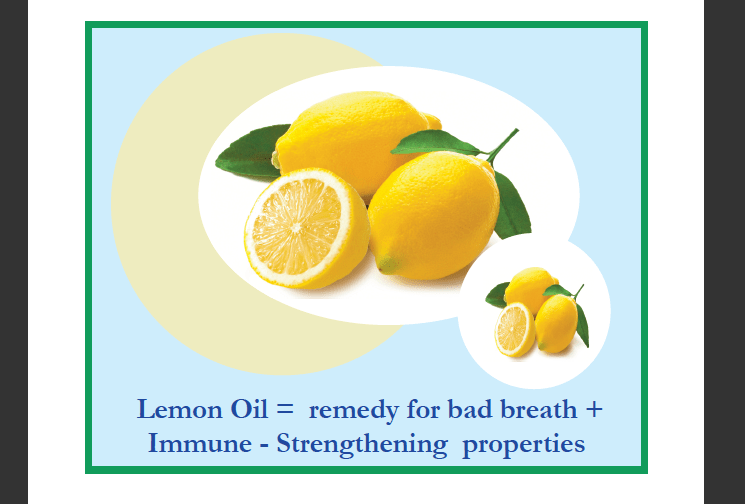 Notably, it is more potent than lemon juice; it takes 3,000 lemon rinds to produce 1 kg of lemon essential oil. The licorice plant is an herbaceous perennil plant native to southern Europe, India, and parts of Asia. In a study, published in the Journal of Natural Products, researches recorded that several compounds present in dried licorice root are effective antibacterial substances that can act to prevent the growth of several major bacteria connected with dental cavities and gum disease. 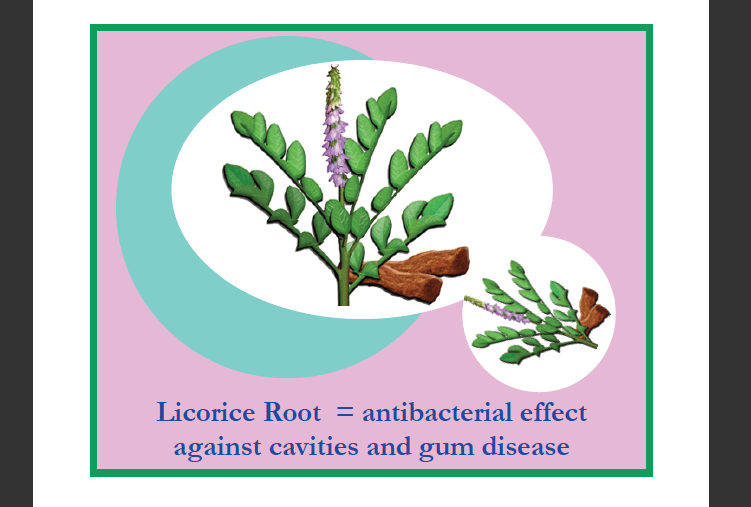 Lab experiments have shown that active substances from licorice root can block the action of a key enzyme that allows bugs to thrive in oral cavities. A recent study in the Journal of Chemical Communications indicated that halting the activity of certain enzyme’s prevents oral bacteria from establishing a protective biological layer or “bio-film” around themselves – enabling them to attach to teeth and thereby form plaque. By preventing assembly of these protective ‘bio-films’ – bacteria forming plaque is stopped. That’s where the Licorice active substances come into play. Limonene takes its name from th lemon, as the rind of the lemon, like other citrus fruits, contains considerable amounts of this compound, which contributes to their aroma. It is one of the major constituents of orange essential oil. The secret to lemon’s success appears to be d-limonene, a powerful cancer fighting antioxidant. Some reports even speculate that lemon oil contains up to 70% d-limonene! It’s no wonder that science is quickly catching up to 1,000 years of therapeutic use and is finally confirming many of the various Ayurvedic medical applications of lemon essential oil. Over 200 species of plants produce linalool, mainly from the families Lamiaceae (mints, scented herbs), Lauraceae (laurels, cinnamon, rosewood) and Rutaceae (citrus fruits), but also birch trees and other plants, from tropical to boreal climate zones. 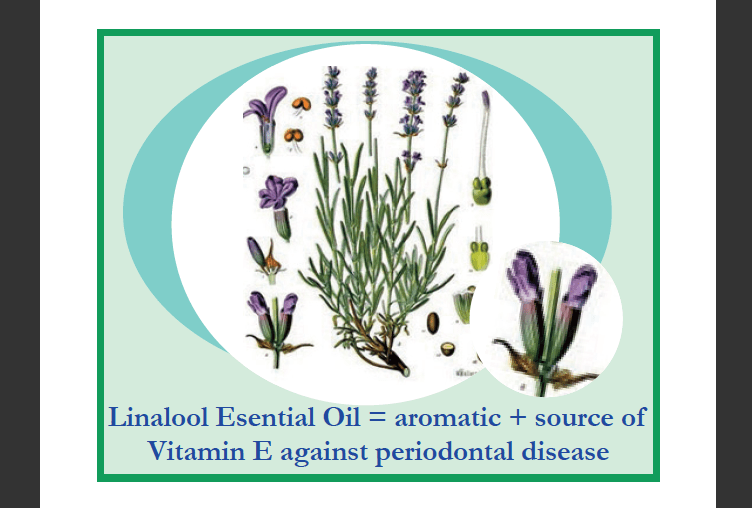 In Oil pulling fresh linalool provides an overall mouth tonic effect orally, an antioxidant effect and source of Vitamin E (which helps against Periodontal disease). Considered as an antibacterial and a soother of motor nerves. Menthol also has the quality of effectively ‘tricking’ the brain into sensing that something is cool or cold. However, we aren’t sucking on an ice cube here – but somehow the menthol delivers the refreshing cool effect – as it ‘hits’ the same receptor buttons in the brain that are hit when we actually do taste or sense coolness – as in eating a real ice cream, or ice cubes etc – hence the words: ‘refreshingly cool minty taste’. Also known for tasting ‘minty’ menthol has a variety of other properties. So, another effect is that it latches onto another receptor, one that produces a gentle ‘numbing effect’. In reality what happens is menthol acts on nearby blood vessels, causing them to widen, thereby increasing blood flow into the area. Increased blood flow carries fresh oxygen and other nutrients into the effected area to repair and replenish the area and carry away toxins and toxic waste – so overall healing and wellness is supported. Additionally, menthol acts to take away the effects of inflammation – so even without any fall in actual temperature – the cooling effect is delivered and benefit is felt. The word “myrrh” derives from the Aramaic (murr), and Arabic (mur) meaning “bitter”. Myrrh is native to Yemen, Somalia, Eritrea and eastern Ethiopia, Eastern Mediterranean and Arabian Penisula. There are many health-enhancing compounds in myrrh oil, such as terpenoids, a class of chemicals with anti-inflammatory and antioxidant effects. 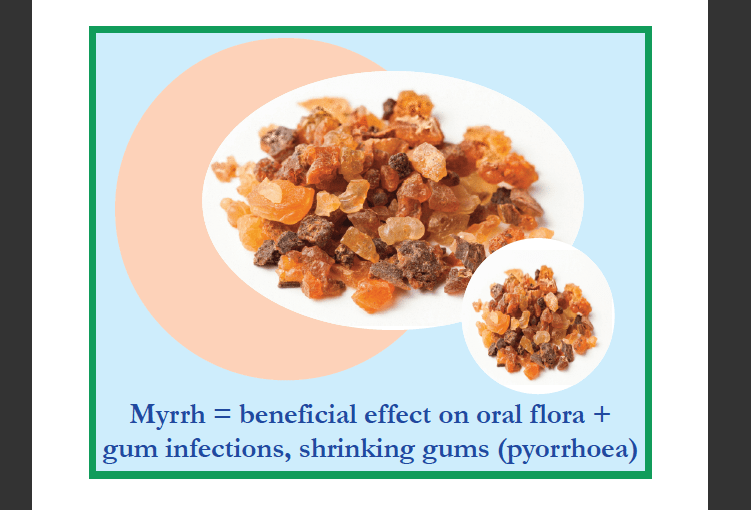 Hence with gum and mouth diseases, Myrrh is credited with relieving toothache, gingivitis, and mouth ulcers, whilst also freshening your breath. Myrrh acts as both an antiseptic and a soother and may also assist gum tissue health by supporting the flow of blood to the tissue. 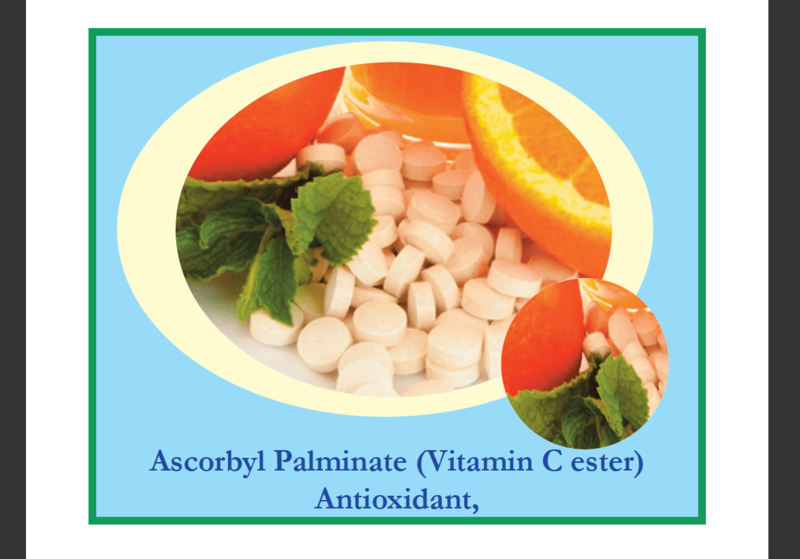 The anti-oxidant activity of Ascorbyl Palmitate is powerful and solves some of the issues of oxidation whiles preserving the benefits of Vitamin C. It also serves to regenerate Vitamin E creating a synergy of anti-oxidant activity. Hence this is he perfect choice for this preservative free tooth oil. Peppermint has enjoyed a long medicinal history. Every culture blessed with peppermint has used the plant for medicine. It is a hybrid mint, a cross between water mintand spearmint. The plant, indigenous to Europe and the Middle East, is now widespread in cultivation in many regions of the world. Researchers have found that the peppermint essential oil is extremely effective at killing anaerobic bacteria that thrive better in a low oxygen environment such as the mouth, helping teeth and gums fight off hazardous germs that can lead to gum disease and bad breath. Peppermint oil extract has even been shown to be superior to the mouthwash chemical chlorhexidine in inhibiting the formation of bio-film formations linked to dental cavities. 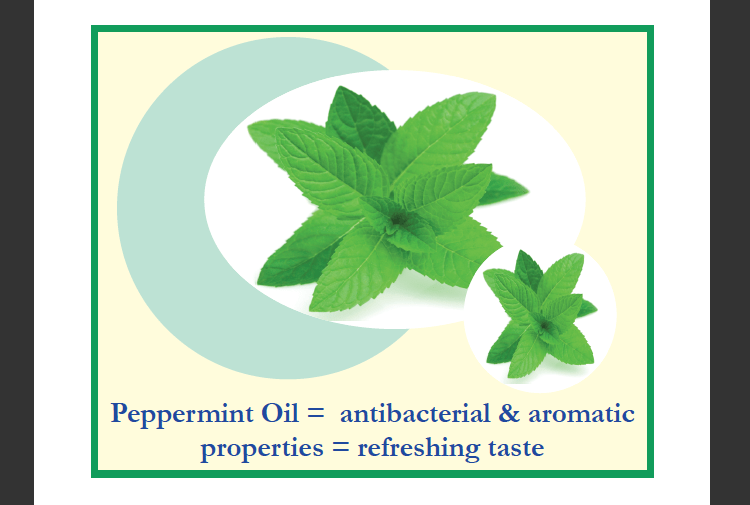 Peppermint has a high menthol content and contains small amounts of many additional compounds including limonene. 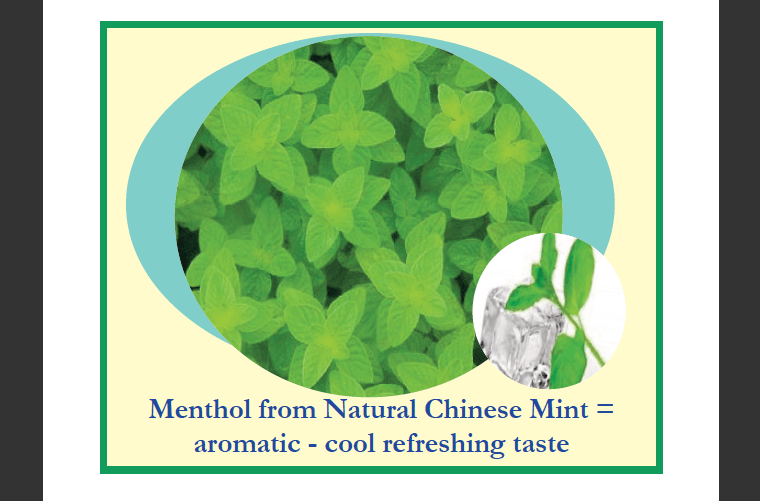 Menthol “tricks the mind” and activates the cold-sensitive TRPM8 receptors in the skin and mucosal tissues, and is the primary source of the cooling sensation that follows the application of peppermint oil. 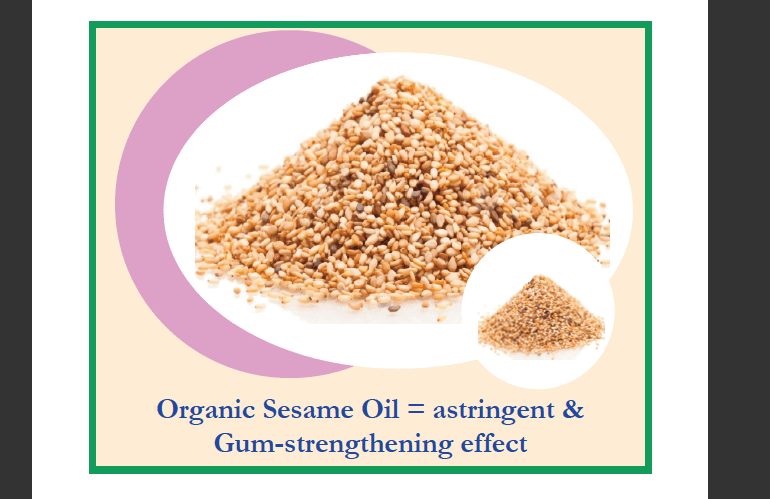 Organic sesame oil is particularly high in antioxidants. It also holds a high concentration of Vitamin E nd Vitamin K. Multiple studies have shown the antibacterial capacities of sesame oil. These studies support the use of oil pulling in the prevention of dental cavities and gingivitis. A 2008 study found a “remarkable reduction in the total count of bacteria” in the mouth of participants using sesame oil, and hence an overall marked reduction in susceptibility to dental cavities. The antibacterial activity of sesame oil was also remarkable having specific effect on Streptococcus mutans within the oral cavity. The studies showed a general reduction in bacteria from 10 to 33.4% in participants, and after 40 days of oil-pulling, participants were found to show 20% average reduction in oral bacteria. 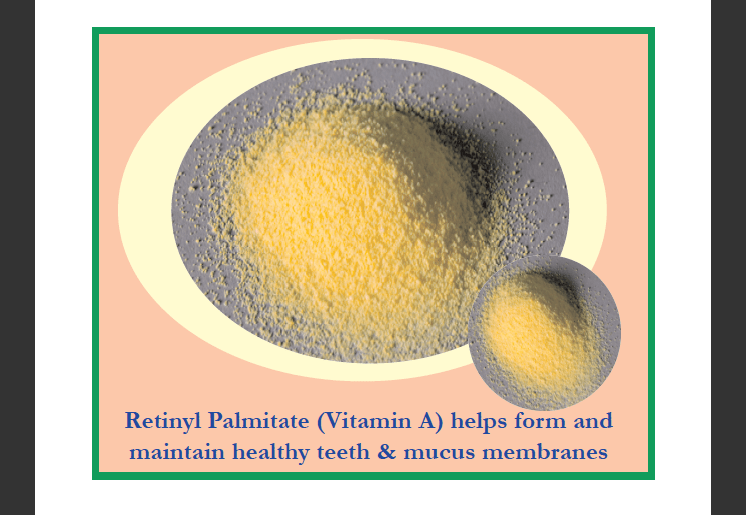 Retinyl palmitate, or vitamin A palmitate, is pure vitamin A. It is often associated with a strong immune system, and orally vitamin A helps maintain healthy mucous membranes and salivary flow in the mouth. It also helps keep your gums healthy and ensures proper healing. You can find it orange and yellow foods like carrots, mangoes and sweet potatoes, and dark leafy greens such as kale, spinach and collard greens contain large amounts of beta-carotene, which the body converts to vitamin A for use. Sage, often regarded as a sacred herb, also called garden sage, or common sage is a perennial, evergreen dwarf-shrub, with woody stems, grayish leaves, and blue to purplish flowers. It is native to the Mediterranean region, though it has naturalized in many places throughout the world. It has a long history of medicinal and culinary use. 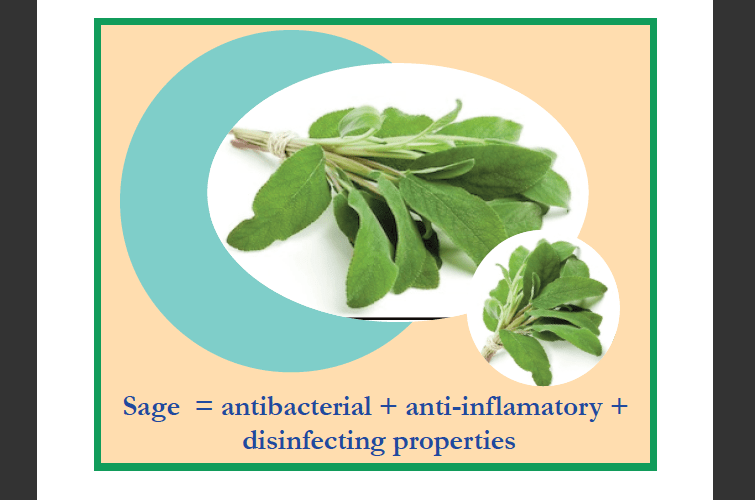 Sage has been recognized by many cultures for its natural tooth-whitening abilities. Known for its astringent, antibacterial, anti-inflammatory properties sage is perfect for oral health and whitening discolored teeth. Star Anise is a medium-sized native evergreen tree of northeast Vietnam and southwest China. A spice commonly called star anise, star anise seed, is obtained from the star-shaped pericarp of the fruit of Illicium velum which are harvested just before ripening. 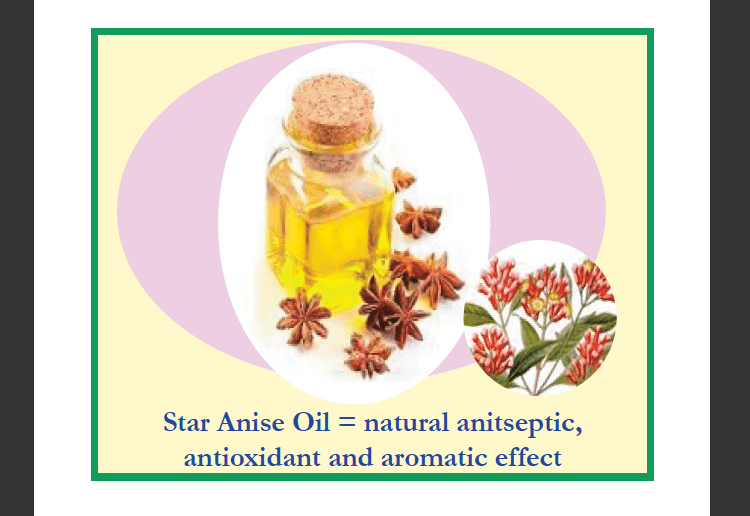 Star anise oil is highly fragrant oil, used for its aromatic and antiseptic properties; it also stimulates blood flow to the gums. In recent years, many micro-organisms have developed multiple drug resistance. Star anise acts as an antibacterial agent and tests have found it to be effective against almost 70 drug resistant bacterial strains. Star anise helps to combat a fungus called Candida albicans. This fungus generally affects superficial skin, mouth, and throat. It has been observed by some Korean researchers that essential oils and some extracts of star anise possess potent antifungal properties. Antioxidants fight against free radicals (atoms or molecules with unpaired electrons) that can cause cellular damage and may be responsible for diseases like diabetes, heart problems or even cancer. Reports from India (in 2007 by Dr. Bhatnagar, School of biochemistry, Devi Ahilya University, Bhopal, M.P) and abroad have shown a potent antioxidant property of star anise. The antioxidant property is due to the presence of a chemical called linalool. 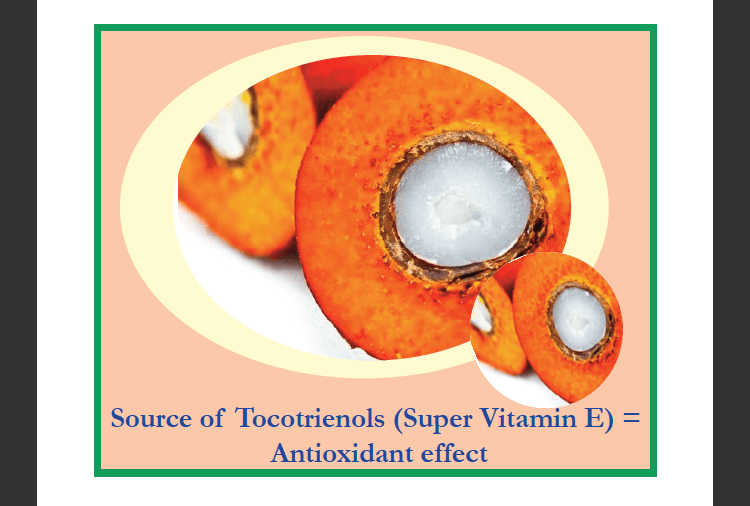 Vitamin A and C also contributes to this property to a large extent. Sunflower oil is the non-volatile oil compressed from sunflower plants. The world’s largest sunflower oil producers now are Russia, Ukraine & Argentina. Sunflower oil is high in the essential Vitamin E.
A benefit of sunflower oil is that it provides a source of alpha-tocopherol, a form of vitamin E that acts as an antioxidant in your body. 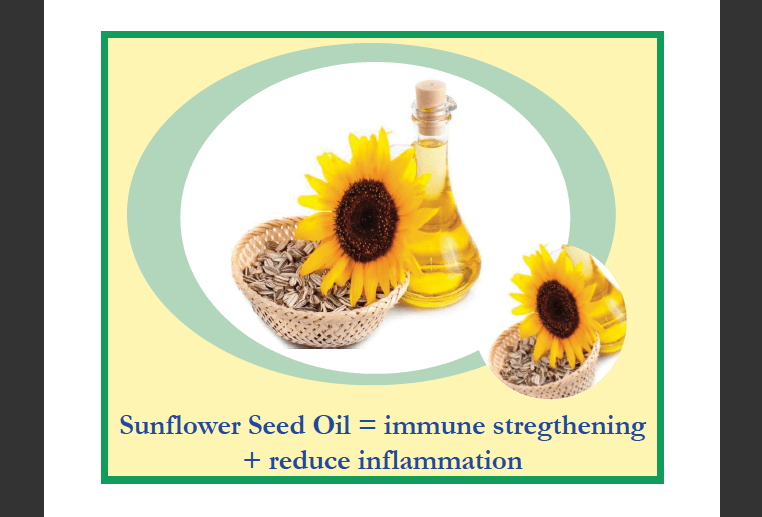 Sunflower oil has more vitamin E than many other good sources, such as most nuts, peanuts and olive, soybean, corn. In a 2007 study looking into the effect of oil pulling (with sunflower oil) on plaque and gingivitis on oral soft and hard tissues found that after 45 days of oil pulling, subjects showed a statistically significant reduction in gingivitis. Periodontal disease is a severe form of gingivitis or gum inflammation, according to the National Institute of Dental and Craniofacial Research. Periodontal disease affects the tissues that surround your teeth: your gum tissue, or gingiva, the ligaments that hold your teeth in place, or the bone that surrounds and stabilizes each tooth root. The disease might develop due to poor oral hygiene, exposure to environmental toxins or as a side effect of an underlying disorder. Vitamin E, an essential nutrient in your diet, might prove beneficial in helping to control the development or progression of periodontal disease. Vitamin E can help to control periodontal disease through its ability to prevent inflammation. Chronic inflammation plays an important role in some cases of periodontal disease. Over time, gingival inflammation causes a recession of gum tissue, and promotes the formation of ulcers, while inflammation of the ligaments or bone leads to tooth loosening or loss. 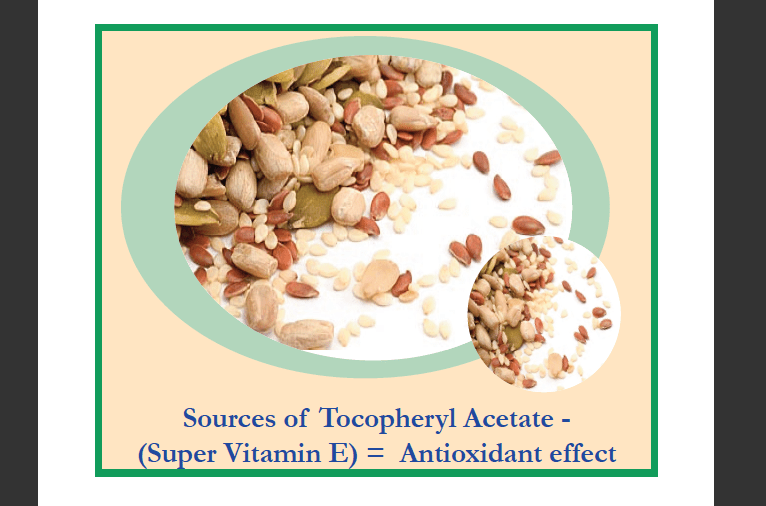 Vitamin E acts as an antioxidant; it prevents the activity of harmful free radicals, which oxidize and damage your tissues. A lack of antioxidants in your mouth can lead to damage of the gum tissue, helping promote the development of periodontal disease. A study published in “Advances in Medical Science” in 2007 found that epilepsy patients with periodontal disease displayed abnormally low levels of vitamin E — as well as other antioxidants — in their mouths and saliva. As a result, consuming vitamin E might help to restore vitamin E levels in and around gum tissue, potentially helping to treat or prevent periodontal disease in some individuals. One of the possible side effects of diabetes is the development of periodontal disease; poorly controlled diabetes disrupts your immune system, increasing your risk for the abnormal inflammation that can lead to periodontal disease. Taking vitamin E might help diabetics control their blood glucose levels. By helping people control their diabetes, vitamin E might help reduce the side effects of the disease, including the development of periodontal disease. This Tooth oil is diabetic safe. 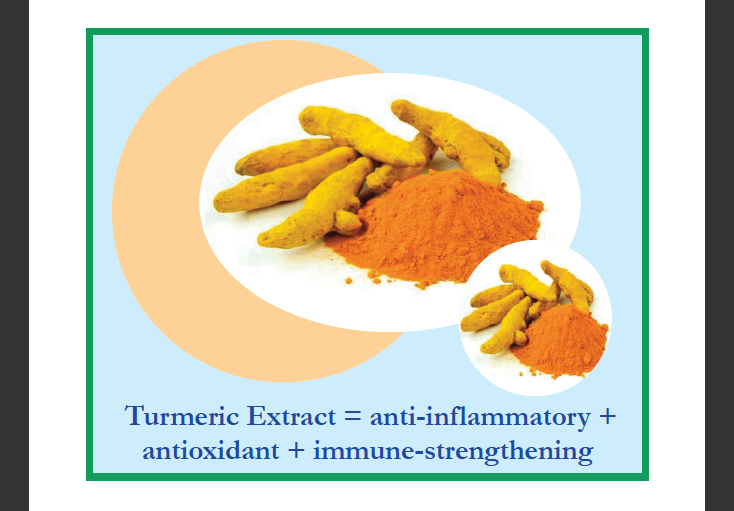 Turmeric is an herbaceous perennial plant of the ginger family. It is native to southwest India, requiring temperatures between 20 and 30 °C (68 and 86 °F) and a considerable amount of annual rainfall to thrive. Some research shows compounds in turmeric to have antifungal and antibacterial properties. Turmeric’s role in oral health has prompted studies ranging from; its effect on oral cancer to more humble enquiries testing it’s effectiveness as a natural alternative to the common mouthwash ingredient known as chlor-hexidine for the treatment of gingivitis. Gingivitis is classified as a non-destructive periodontal disease and involves bacterial plaque-induced inflammation, but if left untreated, it can progress to a form of periodontal disease hat can be highly destructive. Some of the most common symptoms associated with gingivitis are bad breath (halitosis), and bleeding, bright, tender or swollen gums. Research continues – with many small-scale India Ayurvedic studies being reported. So there you have it – an overview of some of the main important active ingredients, which if used fresh, can be employed to support and improve your oral wellness when oil pulling. As with all products the prevailing philosophy remains: for anything we may apply to our skin or ingest, the effectiveness is only delivered via active ingredients and for active ingredients to indeed be active – they need to be administered fresh. Hence the guidance is that once opened this specially optimised Tooth Oil is good for at least 10 weeks – you can order 125ml bottles which take approx 5 days to arrive. Watch the Video which features some of the active ingredients combined in this special Tooth Oil – for excellent Oil Pulling results. I’m on day 12 and I swish while in the shower…after the first couple seconds of acknowledging you have oil in your mouth, it’s no worry and I’ve grown to enjoy it – in fact I miss it when I don’t use it. Great for Mouth Ulcers also. Oil Pulling has no side effects. Just dont swallow the oil after swishing otherwise you ingest all the bacteria you are trying to get rid of. Been using it for few month’s – highly recommend it to everyone. I have always taken care of my teeth. I used to floss and brush daily and adopted healthy dental hygiene. Even then, I started having toothaches. A friend recommended using oil pulling and I came across this Tooth Oil at the Vegfest in Olympia. It really did wonders! I have not had any tooth-related complaints after using it. Recommend. I just started oil pulling and I had the same concern. It’s actually surprisingly easy to push the oil to the front of your mouth (without making a mess and dribbling etc.) to swallow. I can’t really explain how. It’s just a natural thing. If you try it you’ll see how I mean. I’ve been doing oil pulling for some time now and I must say do feel positive results such as, reduced sensitivity on teeth and gums plus less tension in my stomach and improved digestion which might be a by-product, basically my mouth is feeling better all round. I was doing oil pulling for about a month or so using some sunflower oil that had been in the kitchen for ages. It was working amazingly well, I couldn’t believe how smooth my teeth felt, and my gums were tighter and not tender anymore, and even the skin on my face was seeming smoother and plumper, as if it was reversing aging! Then I did some cooking with this same oil and it gave me diarrhea. It seemed the oil was past its best and not fit for using. So I threw it away and got a fresh bottle, assuming it would also be best to use fresher stuff for oil pulling too. I just started oil pulling and I had the same concern. It’s actually surprisingly easy to push the oil to the front of your mouth (without making a mess and dribbling etc.) to swallow. I can’t really explain how. It’s just a natural thing. If you try it you’ll see how I mean. I do like the idea of a tooth oil with multiple natural constituents – which work in synchronicity – so you don’t necessarily have to pull for so long to get the same result. I use sesame oil and I have excessive salivia. My solution is to spit a little at the five minute mark and then spit a little at the 10 minute mark. I can’t make it to 20 minute mark and it doesn’t feel right for me to push it. That said, my temperature and pressure sensitive teeth are no longer sensitive. And I enjoy other health benefits too. I have no desire to switch from sesame oil. I researched oil pulling and I read on a very prominent doctors website that 20 minutes is not necessary to swish the oil in your mouth. You only need 3-5 minutes and it will do the job. 20 minutes is way too long anyway! – So this tooth oil with many ingredients – rather then just one ingredient – will presumably do the job much better. Is that the idea?